Spider plants, tremble in fear. The highlight of Lilo’s week, other than escaping out the back door and hiding under the deck a few times, was the other night when we had our first frost. I brought in several my houseplants from outside to keep them from getting frost-killed and stuck as many as I could in the kitchen sink to rinse them off and water them. Lilo immediately jumped up for a snack. The spider plant (the plant with long narrow leaves that she’s munching on above) is her favorite. 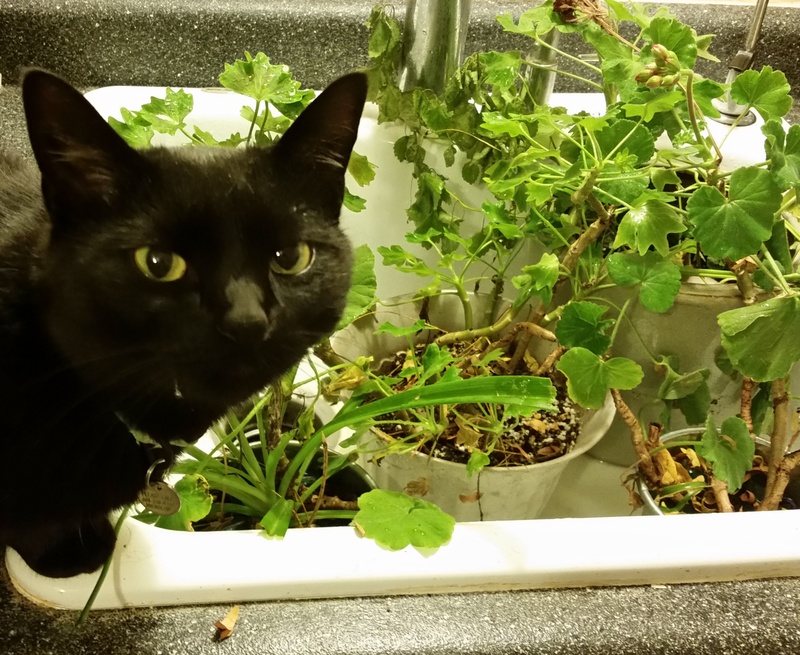 It’s harmless to cats, and I let her go bonkers on the spider plants throughout the winter—I’d rather have her eating those than fabric. 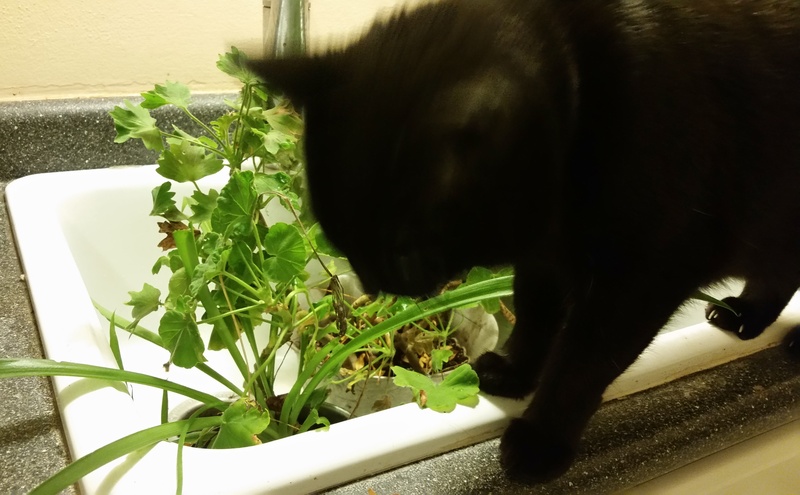 The other plants you see in the sink are tropical geraniums (also known as pelargonium). These are mildly toxic to cats and dogs, but since they are an oral irritant, cats generally don’t eat enough to cause problems. 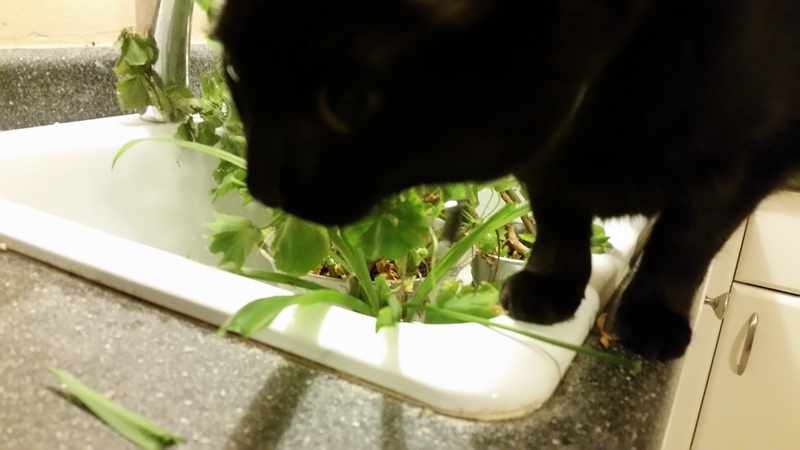 Lilo occasionally gives a leaf a nibble, but she’s more interested in the spider plants. In less than five minutes, Lilo had decapitated most of the spider plant leaves. I have 10 or 15 more spider plants to bring in. (I covered them wth a towel on the night of the frost to protect them).